Once again, cauliflower proves itself to be the most versatile vegetable for creating new ways to add variety to your vegetable choices. It so easily takes on the flavors of other ingredients, providing you with endless options for recipes. Even if you don’t care for cauliflower, try this recipe. The Tahini is necessary for creating a true hummus flavor, so don’t skip on that ingredient. This recipe is adapted from the ibreatheimhungry.com website. Use fresh cucumber, zucchini or yellow squash slices, celery, radishes or peppers for dipping. 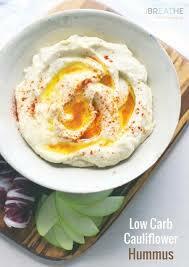 Since the cauliflower is cooked, use 1 cup raw veggies and 1/2 cup of the hummus to provide one serving of vegetables. Your fat serving is also included. Combine the cauliflower with 2 Tbsp avocado oil, and 3 whole garlic cloves and spread onto a parchment lined baking sheet. Roast at 375°F for 30-40 minutes until very tender. Place Option 1 or 2 mixture into a bullet, blender or food processor and blend. Add the tahini paste, lemon juice, 2 raw garlic cloves, 3 Tbsp of olive oil and salt. Blend until smooth. Serve in a bowl and sprinkle with paprika.